What a wonderful world we live in: the quality is in favor, music is popular as never before, accessible for everyone who's willing to fill their days with sounds. The transition to High-Definition audio is one of the greatest achievements of modern society which marks the complete defeat of consumerism in music, and it's something you and me should be proud about. Like any major change, this one also leads to some complications with the way we store and listen to music. This is because High-Definition songs are uncompressed (or underwent lossless compression). What we would usually hear from Youtube, streaming services or radio is a compressed audio which has small size as it was deliberately reduced to take less space, but the main 'but' in this story is that during the compression process lots of audio data is irreversibly lost. That is how we have ten-minute tracks that take up 5 MB. High-Definition audio has a bit more elaborate audio codecs and is more difficult to support from the technical point of view. Apple, for instance, created their own Hi-Res formats and called it ALAC (Apple Lossless Audio Codec). What is interesting about these formats is that they transmit the original sound of a recording with all the finest nuances. Meanwhile, lossy music lacks high frequencies and sounds 10% of what it actually could have. It's like you watch a trailer and think we've seen a film. OK, if playing High-Definition music is somehow possible through conversion FLAC or WAV to ALAC, or using special apps like VOX Music Player (later on that), storing it remains a knotty problem. Most online music locker either convert any Hi-Res format to MP3 (or AAC) or just don't let you upload it. However, there's one that surpasses the rest in the number of supported formats, storage capacity, and functionality. VOX Cloud is available on Mac, iPhone and Apple Watch, however, using VOX Cloud requires to have VOX Premium account in VOX Music Player. See for yourself. Here's to how to easily free your HDD space and listen to all your music with VOX Cloud by the Coppertino team. Download VOX Music Player for Mac. It’s absolutely free! Create VOX Premium account. Choose your music files and simply drag & drop it to VOX Cloud. Step 3. Enjoy your Hi-Res collection. VOX is a great music player for Mac that plays file formats not supported by iTunes or iPhone’s Music app. The player was created for music lovers and thanks to its audio engine the quality of the sound is exceptional, and it supports a relatively impressive number of audio formats (FLAC, ALAC, MP3, WMA, APE, etc.) What about features, it has everything you could ever ask from an audio player – playlists, equalizer with presets, AirPlay, BS2B, radio (available via in-app purchase), a plenty of preferences for the playback customization and so on. In a nutshell, VOX is an audio player and an audio player alone. You can’t buy or stream song like on Apple Music. 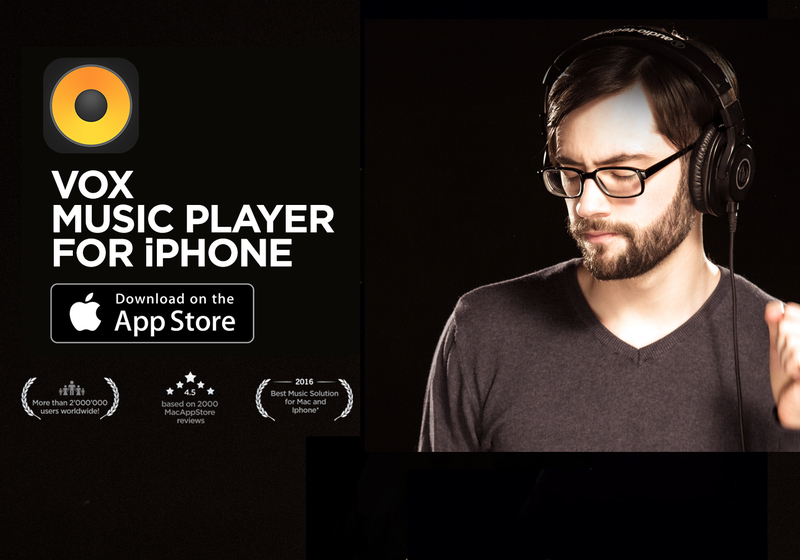 What you can do is to enjoy music from the app with a smooth, and easy-to-understand interface. You can play your High-Definition files on your iPhone or Mac. It is possible to play music from VOX with Sonos speakers, which is by far the best audio system to fully experience Hi-Res sound. It lets you sync all your Mac and iPhone music libraries. You can use one VOX Premium account for all your devices. It supports a broad array of audio formats. You may both lossy and lossless music. However, we thoroughly recommend you to give your preference to lossless music. The times of conversion lossless to lossy are already in the past and VOX Cloud played a great deal in it. The playback is outstanding, that's for sure. Why? Just because VOX was designed for music lover by music lovers and it means that the major focus was the quality of the playback. Fortunately, developers at Coppertino have concluded that storing High-Definition audio files on any device is inconvenient and somewhat old-fashioned. It’s the era of online music lockers, and VOX Music Cloud Storage is the one solution. Now that we don’t fret over the HHD space the possibility of our music to be compressed, we can relax and appreciate what musician recorded in studios. The quality of the sound is fantastic, and each song makes you believe artists are singing right next to you.